Canada's exports declined 3.8% in December, almost entirely on lower exports of energy products, which were down as a result of falling crude oil prices. Imports were up 1.6%, mainly on higher imports of energy products. As a result, Canada's merchandise trade deficit with the world widened from $2.0 billion in November to a record $4.6 billion in December. Exports to countries other than the United States were down 4.2% to $12.6 billion. Lower exports to the United Kingdom and Hong Kong (gold in both cases) were partially offset by higher exports to China (various products). As a result, Canada's trade deficit with countries other than the United States widened from $4.2 billion in November to $6.4 billion in December. Following a 5.0% decrease in November, exports to the United States were down 3.6% to $33.7 billion in December, mostly on lower crude oil exports. Imports from the United States were down 2.4% to $31.9 billion, mainly on lower imports of aircraft. As a result, Canada's trade surplus with the United States narrowed from $2.2 billion in November to $1.8 billion in December. Comparing the average exchange rates, the Canadian dollar lost 1.4 US cents relative to the American dollar from November to December. 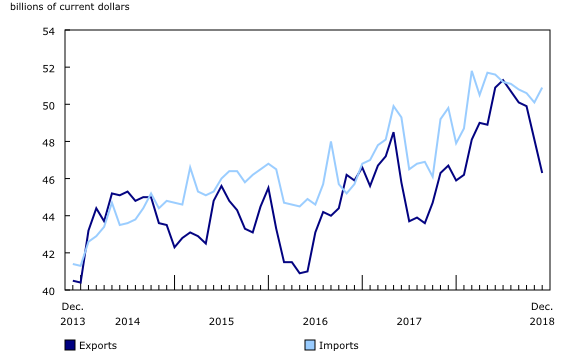 Annual imports were up 5.7% to $607.1 billion in 2018 with increases in all product sections. Consumer goods and industrial machinery, equipment and parts posted the largest increases. Despite recent monthly declines, annual exports were up 6.5% to $585.4 billion, led by higher exports of energy products. 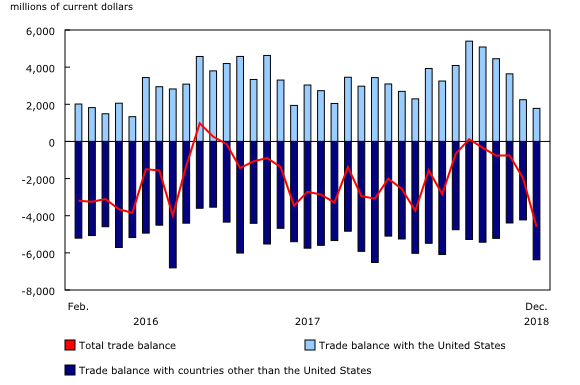 Canada's merchandise trade deficit with the world therefore narrowed from $24.6 billion in 2017 to $21.7 billion in 2018. In real (or volume) terms, annual imports were up 3.3% to $543.4 billion, while annual real exports rose 4.2% to $556.4 billion. Revisions reflect initial estimates being updated with or replaced by administrative and survey data as they become available, as well as amendments made for late documentation of high-value transactions. Exports in November, originally reported as $48.3 billion in the last release, were revised to $48.1 billion. November imports, originally reported as $50.4 billion in the last release, were revised to $50.1 billion in the current month's release. Statistics Canada and the United States Census Bureau have identified March 27, 2019, as the new joint release date for the publication of international merchandise trade statistics for the January 2019 reference month. In addition, the release date for the February 2019 reference month has been postponed to April 17, and the March 2019 reference month to May 9. Presently, the publication date for April 2019 reference month remains June 6 as originally planned. Real-time table 12-10-0120-01 will be updated on March 18. Data on Canadian international merchandise trade for January will be released on March 27.